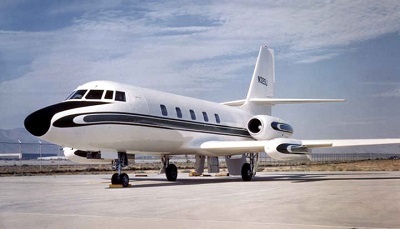 If you like aeroplanes, are a music fan and have a dollar or two to spare, you might care to log-on to the website of Beverly Hills auction house GWS next Saturday, 27 May, when Elvis Presley’s first jet, a customised 1962 Lockheed Jetstar, is coming up for grabs. It has been hidden away in the “aircraft boneyard” in Roswell, New Mexico, where retired commercial aircraft go to die and is a local tourist attraction, but is now being sold by a private collector. The auction house says it still has the original woodwork, inlay, red velvet seats and red carpet, with “the potential to be fully restored and made the centrepiece of a major exhibit”, according to an official. There is no reserve and the auction will begin at 10am Pacific Time, 6pm BST, with online bidding available. Decades in the desert have taken their toll on the Jetstar’s appearance, so to spare its blushes we present a picture of what it did look like and, given the restoration, presumably will do again.